Definition at line 383 of file msipriv.h. Definition at line 404 of file msipriv.h. Referenced by ACTION_PerformAction(), and internal_ui_handler(). Definition at line 400 of file msipriv.h. Definition at line 413 of file msipriv.h. Referenced by free_package_structures(), load_appid(), load_given_appid(), and msi_alloc_package(). Definition at line 424 of file msipriv.h. Referenced by free_package_structures(), MSI_CreatePackage(), msi_load_media_info(), and ready_media(). Definition at line 398 of file msipriv.h. Referenced by create_temp_binary(), free_package_structures(), get_temp_binary(), and msi_alloc_package(). Definition at line 399 of file msipriv.h. Referenced by free_package_structures(), msi_add_cabinet_stream(), msi_alloc_package(), and msi_get_cabinet_stream(). Definition at line 406 of file msipriv.h. Referenced by msi_destroy_assembly_caches(), msi_get_assembly_path(), msi_init_assembly_caches(), msi_install_assembly(), msi_load_assembly(), and msi_uninstall_assembly(). Definition at line 407 of file msipriv.h. Referenced by msi_destroy_assembly_caches(), msi_init_assembly_caches(), msi_install_assembly(), msi_load_assembly(), and msi_uninstall_assembly(). Definition at line 433 of file msipriv.h. Definition at line 434 of file msipriv.h. Definition at line 409 of file msipriv.h. Referenced by ACTION_RegisterClassInfo(), ACTION_UnregisterClassInfo(), free_package_structures(), load_class(), load_classes_and_such(), load_given_class(), and msi_alloc_package(). Definition at line 445 of file msipriv.h. Referenced by ACTION_CustomAction(), and MsiGetMode(). Definition at line 392 of file msipriv.h. Referenced by ACTION_CostFinalize(), ACTION_GetComponentInstallStates(), ACTION_InstallValidate(), ACTION_MsiPublishAssemblies(), ACTION_MsiUnpublishAssemblies(), ACTION_ProcessComponents(), ACTION_RemoveFiles(), free_package_structures(), get_client_counts(), get_volume_space_required(), msi_alloc_package(), msi_get_loaded_component(), msi_load_all_components(), and MSI_SetFeatureStates(). Definition at line 437 of file msipriv.h. 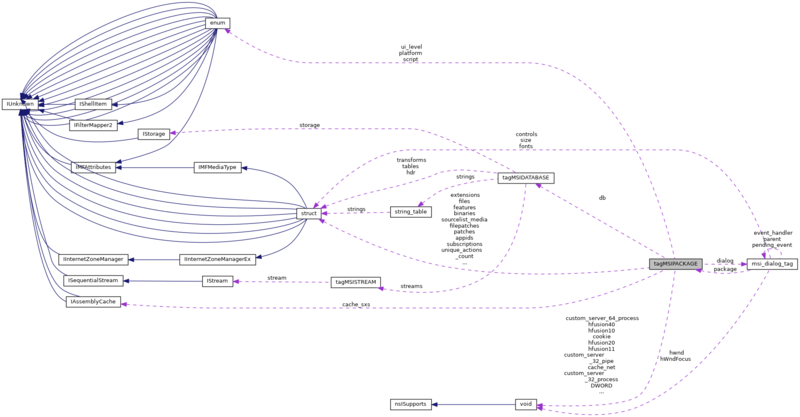 Referenced by ACTION_MsiPublishAssemblies(), ACTION_MsiUnpublishAssemblies(), ACTION_ProcessComponents(), ACTION_PublishFeatures(), ACTION_PublishProduct(), ACTION_RegisterProduct(), ACTION_RegisterUser(), ACTION_ResolveSource(), ACTION_UnpublishProduct(), find_published_source(), get_install_location(), msi_apply_registered_patch(), msi_build_icon_path(), msi_load_media_info(), MSI_OpenPackageW(), msi_publish_patches(), msi_publish_sourcelist(), msi_publish_upgrade_code(), msi_set_context(), and msi_unpublish_feature(). Definition at line 386 of file msipriv.h. Referenced by ACTION_AllocateRegistrySpace(), ACTION_AppSearch(), ACTION_AppSearchComponents(), ACTION_AppSearchDr(), ACTION_AppSearchGetSignature(), ACTION_AppSearchIni(), ACTION_AppSearchReg(), ACTION_BindImage(), ACTION_CCPSearch(), ACTION_CostFinalize(), ACTION_CostInitialize(), ACTION_CreateFolders(), ACTION_CreateShortcuts(), ACTION_CustomAction(), ACTION_DeleteServices(), ACTION_DisableRollback(), ACTION_DuplicateFiles(), ACTION_ExecuteAction(), ACTION_FindRelatedProducts(), ACTION_INSTALL(), ACTION_InstallFiles(), ACTION_InstallODBC(), ACTION_InstallServices(), ACTION_InstallValidate(), ACTION_LaunchConditions(), ACTION_MigrateFeatureStates(), ACTION_MoveFiles(), ACTION_PerformActionSequence(), ACTION_ProcessComponents(), ACTION_ProcessExecSequence(), ACTION_ProcessUISequence(), ACTION_PublishComponents(), ACTION_RegisterFonts(), ACTION_RegisterProduct(), ACTION_RegisterTypeLibraries(), ACTION_RegisterUser(), ACTION_RemoveDuplicateFiles(), ACTION_RemoveEnvironmentStrings(), ACTION_RemoveExistingProducts(), ACTION_RemoveFiles(), ACTION_RemoveFolders(), ACTION_RemoveIniValues(), ACTION_RemoveODBC(), ACTION_RemoveRegistryValues(), ACTION_RemoveShortcuts(), ACTION_ResolveSource(), ACTION_SelfRegModules(), ACTION_SelfUnregModules(), ACTION_SetODBCFolders(), ACTION_ShowDialog(), ACTION_StartServices(), ACTION_StopServices(), ACTION_UnpublishComponents(), ACTION_UnregisterFonts(), ACTION_UnregisterTypeLibraries(), ACTION_WriteEnvironmentStrings(), ACTION_WriteIniValues(), ACTION_WriteRegistryValues(), append_productcode(), apply_substorage_transform(), cabinet_open_stream(), check_transform_applicable(), create_temp_binary(), create_temp_property_table(), defer_custom_action(), get_assembly_record(), get_duplicate_filename(), get_ini_file_name(), get_root_key(), get_source_root(), HANDLE_CustomType19(), HANDLE_CustomType23(), HANDLE_CustomType50(), HANDLE_CustomType53_54(), HANDLE_CustomType5_6(), is_obsoleted_by_patch(), load_all_classes(), load_all_extensions(), load_all_files(), load_all_folders(), load_all_media(), load_all_mimes(), load_all_patches(), load_all_progids(), load_all_verbs(), load_file_disk_id(), load_file_hash(), load_folder_persistence(), load_given_appid(), load_given_class(), load_given_extension(), load_given_mime(), load_given_progid(), load_patch_disk_id(), msi_adjust_privilege_properties(), MSI_ApplicablePatchXML(), msi_apply_patch_db(), msi_apply_patches(), msi_apply_transforms(), msi_build_icon_path(), msi_change_media(), msi_check_patch_applicable(), MSI_CreatePackage(), msi_dialog_fill_controls(), msi_dialog_set_property(), msi_get_dialog_record(), MSI_GetProperty(), MSI_InstallPackage(), msi_load_admin_properties(), msi_load_all_components(), msi_load_all_features(), msi_load_assembly(), msi_load_media_info(), msi_load_suminfo_properties(), msi_media_get_disk_info(), MSI_OpenPackageW(), msi_parse_command_line(), MSI_ProcessMessage(), msi_publish_icons(), msi_publish_install_properties(), msi_publish_product_properties(), msi_publish_upgrade_code(), msi_resolve_target_folder(), MSI_Sequence(), msi_set_context(), msi_set_sourcedir_props(), MSI_SetFeatureStates(), MSI_SetInstallLevel(), msi_unimplemented_action_stub(), msi_unpublish_icons(), msi_validate_product_id(), MsiEnumComponentCostsW(), MsiGetActiveDatabase(), MsiGetLanguage(), MsiGetMode(), MsiGetProductPropertyW(), MsiSetFeatureAttributesW(), MsiSetPropertyW(), patch_add_media(), patch_file(), patch_set_media_source_prop(), patchfiles_cb(), process_overrides(), process_state_property(), ready_media(), remove_product_upgrade_code(), resolve_keypath(), set_deferred_action_props(), set_installed_prop(), set_installer_properties(), set_msi_assembly_prop(), set_target_path(), set_user_sid_prop(), ui_actioninfo(), ui_actionstart(), ui_sequence_exists(), and yyparse(). Definition at line 428 of file msipriv.h. Referenced by ACTION_RegisterProduct(), ACTION_UnpublishProduct(), and MSI_OpenPackageW(). Definition at line 431 of file msipriv.h. Definition at line 419 of file msipriv.h. Definition at line 410 of file msipriv.h. Referenced by ACTION_RegisterExtensionInfo(), ACTION_UnregisterExtensionInfo(), free_package_structures(), has_all_extensions_removed(), has_extensions(), has_one_extension_installed(), load_classes_and_such(), load_extension(), load_given_extension(), and msi_alloc_package(). Definition at line 393 of file msipriv.h. Referenced by ACTION_GetFeatureInstallStates(), ACTION_InstallValidate(), ACTION_PublishFeatures(), ACTION_RefCountComponent(), ACTION_UnpublishFeatures(), ACTION_UpdateComponentStates(), free_package_structures(), is_full_uninstall(), msi_alloc_package(), msi_check_publish(), msi_check_unpublish(), msi_get_loaded_feature(), msi_load_all_features(), msi_seltree_add_child_features(), MSI_SetFeatureStates(), MSI_SetFeatureStateW(), and process_state_property(). Definition at line 395 of file msipriv.h. Referenced by ACTION_PatchFiles(), find_filepatch(), free_package_structures(), load_all_patches(), and msi_alloc_package(). Definition at line 394 of file msipriv.h. Referenced by ACTION_InstallFiles(), ACTION_InstallValidate(), ACTION_RefCountComponent(), ACTION_RemoveFiles(), calculate_file_cost(), find_file(), free_package_structures(), load_all_files(), msi_alloc_package(), msi_get_loaded_file(), MSI_SetTargetPathW(), and schedule_install_files(). Definition at line 397 of file msipriv.h. Referenced by free_package_structures(), load_all_folders(), msi_alloc_package(), msi_get_loaded_folder(), and msi_reset_folders(). Definition at line 385 of file msipriv.h. Referenced by do_msidbCustomActionTypeDll(), do_msidbCustomActionTypeScript(), MSI_CreatePackage(), MSI_EnableUIPreview(), MSI_GetProperty(), MSI_GetSourcePath(), MSI_GetTargetPath(), MSI_OpenPackageW(), MsiCollectUserInfoA(), MsiCollectUserInfoW(), MsiConfigureFeatureW(), MsiDetermineApplicablePatchesW(), MsiDeterminePatchSequenceW(), MsiDoActionW(), MsiEnumComponentCostsW(), MsiEvaluateConditionW(), MsiFormatRecordW(), MsiGetActiveDatabase(), MsiGetComponentStateW(), MsiGetFeatureCostW(), MsiGetFeatureInfoW(), MsiGetFeatureStateW(), MsiGetLanguage(), MsiGetMode(), MsiGetProductPropertyW(), MsiOpenPackageExW(), MsiProcessMessage(), MsiReinstallFeatureW(), MsiSequenceW(), MsiSetComponentStateW(), MsiSetFeatureAttributesW(), MsiSetFeatureStateW(), MsiSetInstallLevel(), MsiSetMode(), MsiSetPropertyW(), and MsiSetTargetPathW(). Definition at line 420 of file msipriv.h. Referenced by ACTION_ExecuteAction(), ACTION_INSTALL(), and check_execution_scheduling_options(). Definition at line 390 of file msipriv.h. Referenced by ACTION_ExecuteAction(), free_package_structures(), match_language(), MSI_OpenPackageW(), parse_suminfo(), and validate_package(). Definition at line 401 of file msipriv.h. Referenced by free_package_structures(), MSI_CreatePackage(), and MSI_ProcessMessage(). Definition at line 403 of file msipriv.h. Referenced by ACTION_ExecuteAction(), MSI_CreatePackage(), and ui_actioninfo(). Definition at line 402 of file msipriv.h. Definition at line 427 of file msipriv.h. Definition at line 405 of file msipriv.h. Referenced by MSI_CreatePackage(), MSI_OpenPackageW(), MSI_ProcessMessageVerbatim(), and MsiGetMode(). Definition at line 412 of file msipriv.h. Referenced by ACTION_RegisterMIMEInfo(), ACTION_UnregisterMIMEInfo(), free_package_structures(), load_classes_and_such(), load_given_mime(), load_mime(), and msi_alloc_package(). Definition at line 447 of file msipriv.h. Referenced by ACTION_ScheduleReboot(), copy_install_file(), MSI_InstallPackage(), MsiGetMode(), and MsiSetMode(). Definition at line 448 of file msipriv.h. Referenced by MsiGetMode(), and MsiSetMode(). Definition at line 449 of file msipriv.h. Referenced by ACTION_HandleStandardAction(), ACTION_ProcessComponents(), msi_get_component_action(), msi_get_feature_action(), and MSI_InstallPackage(). Definition at line 432 of file msipriv.h. Definition at line 389 of file msipriv.h. Referenced by ACTION_ExecuteAction(), match_language(), MSI_OpenPackageW(), parse_suminfo(), and validate_package(). Definition at line 425 of file msipriv.h. Referenced by ACTION_ProcessComponents(), ACTION_ResolveSource(), free_package_structures(), msi_apply_transforms(), MSI_CreatePackage(), MSI_InstallPackage(), and msi_publish_sourcelist(). Definition at line 391 of file msipriv.h. Referenced by ACTION_PublishProduct(), ACTION_UnpublishProduct(), free_package_structures(), is_obsoleted_by_patch(), is_registered_patch_media(), msi_alloc_package(), msi_apply_patch_db(), and msi_publish_patches(). Definition at line 388 of file msipriv.h. Referenced by ACTION_RegisterClassInfo(), ACTION_RegisterProduct(), ACTION_UnpublishProduct(), ACTION_UnregisterClassInfo(), parse_suminfo(), set_installed_prop(), and validate_package(). Definition at line 426 of file msipriv.h. Referenced by ACTION_ExecuteAction(), ACTION_ForceReboot(), ACTION_GetComponentInstallStates(), ACTION_GetFeatureInstallStates(), ACTION_MsiPublishAssemblies(), ACTION_ProcessComponents(), ACTION_PublishFeatures(), ACTION_PublishProduct(), ACTION_RegisterProduct(), ACTION_RegisterUser(), ACTION_ResolveSource(), ACTION_UnpublishProduct(), find_published_source(), free_package_structures(), get_install_location(), msi_apply_registered_patch(), msi_build_icon_path(), msi_create_component_advertise_string(), MSI_CreatePackage(), MSI_InstallPackage(), MSI_OpenPackageW(), msi_publish_patches(), msi_publish_sourcelist(), msi_publish_upgrade_code(), msi_set_context(), msi_unpublish_feature(), remove_product_upgrade_code(), set_installed_prop(), and set_installer_properties(). Definition at line 411 of file msipriv.h. Referenced by ACTION_RegisterProgIdInfo(), ACTION_UnregisterProgIdInfo(), free_package_structures(), load_classes_and_such(), load_given_progid(), load_progid(), and msi_alloc_package(). Definition at line 446 of file msipriv.h. Definition at line 422 of file msipriv.h. Referenced by ACTION_FinishCustomActions(), file_running_action(), and msi_alloc_package(). Definition at line 444 of file msipriv.h. Definition at line 415 of file msipriv.h. Referenced by execute_script(), msi_free_action_script(), and msi_schedule_action(). Definition at line 416 of file msipriv.h. Definition at line 441 of file msipriv.h. Referenced by free_package_structures(), msi_alloc_package(), msi_package_add_info(), and msi_publish_sourcelist(). Definition at line 442 of file msipriv.h. Referenced by free_package_structures(), msi_alloc_package(), msi_package_add_media_disk(), and msi_publish_sourcelist(). Definition at line 439 of file msipriv.h. Referenced by event_cleanup_subscriptions(), msi_alloc_package(), msi_event_cleanup_all_subscriptions(), and msi_event_fire(). Definition at line 396 of file msipriv.h. Definition at line 430 of file msipriv.h. Referenced by HANDLE_CustomType19(), internal_ui_handler(), MSI_CreatePackage(), and needs_ui_sequence(). Definition at line 417 of file msipriv.h. Referenced by free_package_structures(), msi_action_is_unique(), and msi_register_unique_action(). Definition at line 418 of file msipriv.h. Definition at line 387 of file msipriv.h. Referenced by parse_suminfo(), and validate_package(). Definition at line 436 of file msipriv.h. Referenced by MSI_CreatePackage(), msi_load_suminfo_properties(), and msi_resolve_source_folder().